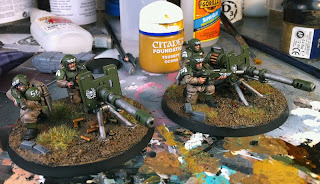 First Rank, Second Rank: Cadian 501st: Autocannons! 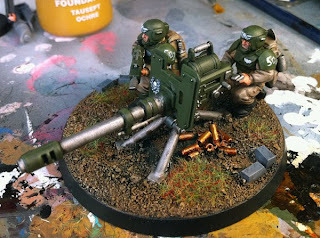 Hey guys, just finished up some Autocannon teams. Just wanted to share a few pics with you. The shell casings are tube beads from Michael's Craft Store. I simply applied them to the bases like I would static grass. Feedback is appreciated! 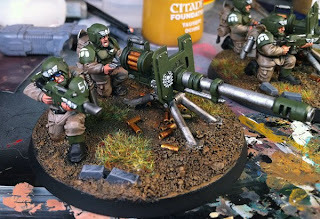 ~ Starting work on Infantry Squad 2 tomorrow night. I have to finish up a commission piece for the local game store.. with the credit the owner is paying me I'm planning on picking up 3 or 4 Chimeras. Keep an eye out for the Krieg weathering techinques to be applied to the Cadian tanks! As always if you have any questions feel free to drop me a line at col.festus@gmail.com.